The Dharma wheel, whose eight spokes represent the eight components of the Buddha's Noble Eightfold Path, is a common feature of much Buddhist iconography. The Noble Eightfold Path (Pāli: Ariyo aṭṭhaṅgiko maggo; Sanskrit:Ārya 'ṣṭāṅga mārgaḥ; Chinese: 八正道, Bāzhèngdào; Japanese: 八正道, Hasshōdō) is the concise summary of the early Buddhist path of moral and spiritual development as defined by Siddhartha Gautama (the historical Buddha). Buddhists (especially the Theravada lineage) claim that this path of practice is the key to escaping the innate suffering (dukkha) of mortal existence and achieving ultimate release (Nirvana). The specific precepts of the Eightfold Path (see below) are part of the Four Noble Truths of Buddhism, the foundational teachings expressing the Buddhism's formative moral and metaphysical outlook. These world-renowned teachings encourage compassion towards all beings, the cultivation of spiritual and moral mindfulness, mental discipline, and the awareness of relationality, among many other aims. In Buddhist iconography, the Noble Eightfold Path is often symbolically represented as the Dharma wheel (Sanskrit: dharmacakra, Pāli: dhammacakka), whose eight spokes represent the eight "branches" of the path (see inset). Though the steps of the Noble Eightfold Path are sequentially numbered, they are not generally understood as a linear progression that the Buddhist aspirant must "complete" in a particular order. Instead, these eight elements "are to be developed more or less simultaneously, as far as possible according to the capacity of each individual. They are all linked together and each helps the cultivation of the others." Further, the eight mental, social, and spiritual efforts they represent are not understood as discrete entities, but are instead seen as mutually contingent "lenses" whose cumulative effect is to focus the individual's religious efforts on the ultimate attainment of Nirvana. Given their respective contributions to the gradual enlightenment of an adherent, each element of the eightfold path is thought to be comprised of two stages: a preliminary stage and a higher stage, both of which are experienced as a progression. And what, O bhikkhus, is right understanding? To understand suffering, to understand the origination of suffering, to understand extinction of suffering, to understand the path leading to the extinction of suffering; this is called right understanding. This discussion of suffering (dukkha) and cessation (nirodha) is a direct paraphrase of the Four Noble Truths. However, this appreciation and application of the Four Noble Truths is simply the preliminary stage of right understanding. The higher stage requires a comprehension and acceptance of the entire Buddhist cosmology (as articulated in the Three Marks and elsewhere), including the doctrines of karma, reincarnation (samsara), the aggregate composition of the human self (skandhas), the dependent origination of worldly phenomena (pratitya sumutpada), and the non-permanence (or even non-existence) of the self (anatman). The "ethical conduct" (Śīla) subdivision of the Noble Eightfold Path is constituted by those praxis elements that pertain to a Buddhist practitioner's relationship with other members of his or her society. They are structured around the Buddhist moral ideal of karuṇā, which is generally translated as "compassion" and is somewhat akin to the Christian notion of agapē or "unconditional love." Further explicating this teaching, Walpola Rahula suggests that not engaging in such "forms of wrong and harmful speech" ultimately means that "one naturally has to speak the truth, has to use words that are friendly and benevolent, pleasant and gentle, meaningful and useful." Right livelihood (samyag-ājīva · sammā-ājīva) is a precept that governs the appropriate occupations for Buddhist lay-people. It is based around the concept of ahiṁsā ("harmlessness" or "non-violence"), and thus states that Buddhist practitioners ought not to engage in trades or occupations that (either directly or indirectly) result in harm to other living beings. Such occupations include, but are not limited to, "trading in arms and lethal weapons, intoxicating drinks, poisons, killing animals, [and] cheating." Likewise, "business in human beings"—such as slave trading and prostitution—is also forbidden, as are several other dishonest means of gaining wealth, such as "[s]cheming, persuading, hinting, belittling, [and] pursuing gain with gain." The "mental discipline" subdivision of the Noble Eightfold Path is constituted by those elements pertaining to a Buddhist practitioner's vigilant efforts to perfect their minds through concerted meditation practice. By making right effort, a Buddhist practitioner is considered to be engaging in a lifestyle that is wholesome in karmic terms (i.e., in terms of that effort's ultimate consequences to the practitioner). (i) There is the case where a monk remains focused on (his/her) body in and of itself … ardent, aware, and mindful … having already put aside worldly desire and aversion. (ii) (He/she) remains focused on feelings in and of themselves … ardent, aware, and mindful … having already put aside worldly desire and aversion. (iii) (He/she) remains focused on the mind  in and of itself … ardent, aware, and mindful … having already put aside worldly desire and aversion. (iv) (He/she) remains focused on mental qualities in and of themselves … ardent, aware, and mindful … having already put aside worldly desire and aversion. Right concentration (samyak-samādhi · sammā-samādhi) (which is possible only in a mind properly condition through "right effort" and "right mindfulness") refers to the practice of Buddhist meditation, with the ultimate goal of consciousness expansion. (ii) With the stilling of directed thought and evaluation, (he/she) enters and remains in the second jhāna: rapture and pleasure born of concentration; fixed single-pointed awareness free from movement of the mind onto the object and retention of the mind on the object. (iii) With the fading of rapture, (he/she) remains in equanimity, mindful and fully aware, and physically sensitive of pleasure. (He/She) enters and remains in the third jhāna which the Noble Ones declare to be "Equanimous and mindful, (he/she) has a pleasurable abiding." (iv) With the abandoning of pleasure and pain… as with the earlier disappearance of elation and distress… (he/she) enters and remains in the fourth jhāna: purity of equanimity and mindfulness, neither in pleasure nor in pain. Buddhism has always been concerned with feelings, emotions, sensations, and cognition. The Buddha points both to cognitive and emotional causes of suffering. The emotional cause is desire and its negative opposite, aversion. The cognitive cause is ignorance of the way things truly occur, or of three marks of existence: that all things are unsatisfactory, impermanent, and without essential self. ↑ In the Pali canon, these three basic categories (Pali: khandha) are identified by the Bhikkhuni Dhammadinna in the "Culavedalla Sutta" (Majjhima Nikaya, 44) although in this sutta the categories are ordered: sīla, samādhi and paññā. These three basic categories are also similar to those articulated by the Buddha in his Threefold Training, as recorded in the Anguttara Nikaya's Sikkha Sutta (3:88  and 3:89 ). ↑ Note: In all of the elements of the Noble Eightfold Path, the word "right" is a translation of the word samyañc (Sanskrit) or sammā (Pāli), which denotes completion, togetherness, and coherence, and which can also carry the sense of "perfect" or "ideal". ↑ Walpola Rahula. What the Buddha Taught. (New York: Grove Press, 1974), 42. ↑ Rewata Dhamma. The First Discourse of the Buddha. (Somerville, MA: Wisdom Publications, 1997), 45. ↑ An idea known as anātman in Sanskrit and anatta in Pāli. Michael H. Kohn. (transl.) The Shambhala Dictionary of Buddhism and Zen. (Boston: Shambhala, 1991), 63. ↑ Magga-vibhanga Sutta: An Analysis of the Path (Samyutta Nikaya 45.8). ↑ For a traditional explanation of these five precepts, see the Abhisanda Sutta (Anguttara Nikaya, 8.39). ↑ Vanijja Sutta: Business (Wrong Livelihood) (Anguttara Nikaya 5.177). ↑ Maha-cattarisaka Sutta: The Great Forty (Majjhima Nikaya 117). In addition, see the The Dighajanu Sutta (Anguttara Nikaya 8:54) for an example of the Buddha's instructions to a householder on the morally proper means of gaining and protecting material wealth. ↑ Quoted in John Snelling. The Buddhist Handbook: A Complete Guide to Buddhist Schools, Teaching, Practice, and History. (Rochester: Inner Traditions, 1999), 50. ↑ The word "self" here can be misleading. Philosophically, Buddhists do not accept the existence of an independent "self" that is isolated from a nexus of interelated existence and causality. ↑ 18.0 18.1 By the term "mind" is meant the "non-physical phenomenon which perceives, thinks, recognises, experiences and reacts to the environment," as per A View on Buddhism, while "mental qualities" refers to such things as intention, concentration, regret, ignorance, etc. Thus, roughly speaking, the mind is the perceiving/conceiving entity, while mental qualities are the perceptions/conceptions. ↑ Gay Watson, 2001. Perspective: "Buddhism Meets Western Science" A dialogue on the mind and consciousness. ↑ Dhammapada, 1:1-2 (page 13 in Carter and Palihawadana's translation). Abhisanda Sutta: Rewards (Anguttara Nikaya 8.39), Translated by Thanissaro Bhikkhu, 1997. Retrieved 27 January 2007. Bodhi, Bhikkhu. 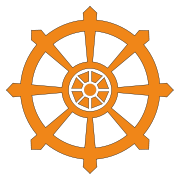 The Noble Eightfold Path: The Way to the End of Suffering information from The Wheel Publication No. 308/311 (Kandy: Buddhist Publication Society, 1984), second edition (revised) 1994. Transcribed from a file provided by the BPS Buddhist Publication Society. Retrieved 4 July 2006. Buddhism: The Dhammapada, Translated by John Ross Carter and Mahinda Palihawadana. New York: History Book Club, 1992. Kohn, Michael H. transl. The Shambhala Dictionary of Buddhism and Zen..Boston: Shambhala, 1991. Magga-vibhanga Sutta: An Analysis of the Path (Samyutta Nikaya 45.8), Translated by Thanissaro Bhikkhu, 1996. Retrieved 27 January 2007. Maha-cattarisaka Sutta: The Great Forty (Majjhima Nikaya 117), Translated by Thanissaro Bhikkhu, 1997. Retrieved 27 January 2007. Rahula, Walpola. What the Buddha Taught. New York: Grove Press, 1974. ISBN 0802130313. Rewata Dhamma. The First Discourse of the Buddha. Somerville, MA: Wisdom Publications, 1997. ISBN 0861711041. Vanijja Sutta: Business (Wrong Livelihood) (Anguttara Nikaya 5.177), Translated by Thanissaro Bhikkhu, 2001. Retrieved 27 January 2007. This page was last modified on 23 April 2008, at 16:49.